- Mark A. Lemley, Stanford Law School, US Over the past twenty years, a number of nonprofit organizations (NPOs), such as Creative Commons, the Electronic Frontier Foundation, and the Free Software Foundation have laid essential building blocks for intellectual-commons as a social movement. 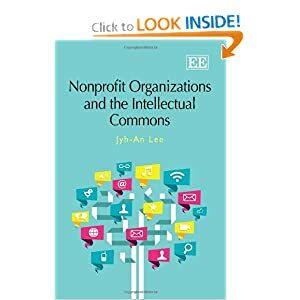 Through a detailed description of these NPOs and a series of in-depth interviews with their officials, this book demonstrates that NPOs have provided the social structures that are necessary to support the production of intellectual commons. By illustrating NPOs' role in shaping the commons realm, this book provides a new lens through which to understand the intellectual-commons environment. Protecting intellectual-commons has been one of the most important goals of recent innovation and information policies. This book focuses on the NPOs that occupy an increasingly critical and visible position in the intellectual-commons environment in recent years. This detailed study will appeal to academics in intellectual property and internet law, nonprofit organizations, academics and professionals, and those involved in the Free Culture and Open Source Software Movement. Contents: 1. Introduction 2. Commons, Intellectual Commons, and Their Tragedies 3. NPOs and the Commons Environment 4. Current NPO Theories and Their Applications 5. Associating NPOs with the Commons Environment 6. Conclusion Appendices Bibliography index.